Full-Trowel Filler Full-Trowel Filler is thinner than Wood Patch, and designed to spread across the surface of the wood floor. Just pour a workable puddle and trowel the floor, going back and forth across the cracks and voids to ensure deep penetration, removing excess filler as you go. Available in 1-gallon containers, in all 16 colors listed in color chart. This one gallon concentrate will refill a 32oz spray bottle 60 times! 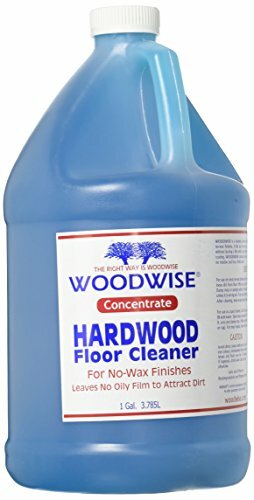 Simply pour 2 oz of Woodwise® Concentrate Hardwood Floor Cleaner into a 32oz spray bottle and fill the rest with water. 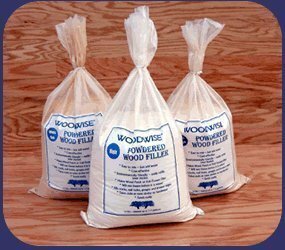 WOODWISE Wood Fillers WOODWISE wood fillers were developed for water and solvent based stains and finishes. 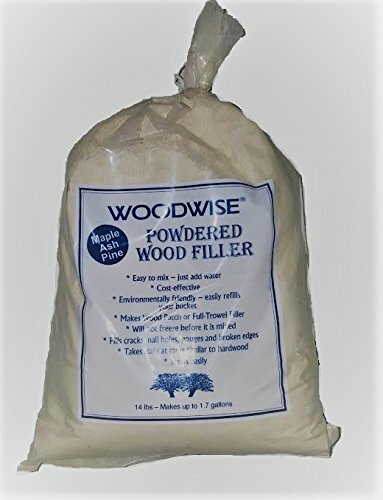 These environmentally friendly wood fillers contain no harsh solvents, and do an outstanding job of filling cracks, nail holes, gouges and broken edges. They take stains at rates similar to wood, and receive natural, light, dark, white and gray stains better than other fillers. WOODWISE is easier to sand, and finishing goes quickly because edger papers don't clog or become dull, lasting 2-3 times longer than with other fillers. 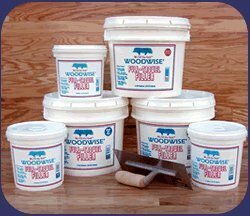 WOODWISE bonds tightly, fills smoothly, dries evenly and hard, and cleans up easily with water. WOODWISE Wood Patch & Full-Trowel Filler are available in 16 different colors. Colors - Brazilian Cherry, Cherry, Coffee, Ebony, Golden Brown, Light Oak, Mahogany, Maple-Ash-Pine, Red Oak, Spice Brown, Walnut, White, White Oak, Purple Heart, Natural Bamboo and Dark Bamboo Wood Patch The higher solid content of Wood Patch makes it ideal for large fill areas or for spot filling during sanding. It can also be thinned and used as a Full-Trowel Filler; simply mix 1-2 cups of water per one gallon of Wood Patch, and trowel floor as directed below. Wood Patch is available in 1-gallon, 1-quart and 14-ounce containers, in all 16 colors listed in color chart. Wood Patch The higher solid content of Wood Patch makes it ideal for large fill areas or for spot filling during sanding. It can also be thinned and used as a Full-Trowel Filler; simply mix 1-2 cups of water per one gallon of Wood Patch, and trowel floor as directed below. 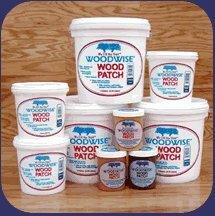 Wood Patch is available in 1-gallon, 1-quart and 14-ounce containers, in all 16 colors listed in color chart. Woodwise is a cleaning solution specially formulated to properly maintain no-wax floor finishes. It removes and lifts soil build-up common to hardwood floors, and doesn't leave an oily film behind which could attract dirt or even interfere with recoating. This cleaner contains no oils or waxes, leaves no residue, and has a fresh scent. Powdered Wood Filler Mix up just the amount of Wood Patch or Full-Trowel Filler whenever you need it! This environmentally friendly system allows you to refill your container and eliminate unnecessary packaging and waste. And you get the same premium performance as our pre-mixed products. Smoothly fills cracks, nail holes, gouges and broken edges. Takes stain like hardwood and sands easily. Bonds tightly, mixes easily in water with a drill mixer. The cost is 30-35% less than our pre-mixed wood filler. Each bag makes up to 1.7 gallons of filler. And it's freeze-proof in its powdered form, so you can leave it in your truck year-round! Available in three colors: Red Oak, White Oak, and Maple-Ash-Pine. Looking for more Woodwise Wood similar ideas? Try to explore these searches: Baby Diva Gift Set, Vanity Shelf Finish, and Sunbrella Pillow. Look at latest related video about Woodwise Wood. Shopwizion.com is the smartest way for online shopping: compare prices of leading online shops for best deals around the web. Don't miss TOP Woodwise Wood deals, updated daily.